Carded Samples can come in a variety of styles. The figures can be painted Hardcopies, Internal First Shots, First Shots, or production figures. The card backs can be Sample Cards, Proof Cards, or production cards. Finally, the bubbles can be hand cut or production quality and can be applied by hand with glue or double sided tape or applied by machine. These samples would mainly be used for presentation internally, as salesman samples, or for photographic purposes. In other words provenance is key when dealing with Carded Samples. With so much variety involved a collector must make sure their source is rock solid. What you see here is a Biker Scout carded sample. A production figure was mounted under a standard machine cut bubble and machine glued to the cardback. The interesting thing about this piece is that the card it is mounted on is a production quality Tie Pilot ROTJ 48 Back "Free Nien Nunb Offer" card. 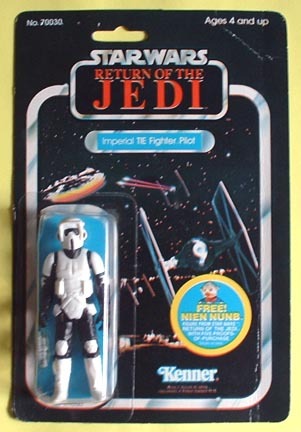 Since the Biker Scout figure was not released until the next wave of figures that came out on the ROTJ 65A back it makes sense that testing was done on an earlier cardback. You'll notice that there was a bit of misregistration of the color plates in the printing press on this cardback causing gaps in color and areas of blurred color. This is most noticeable in the white edges located in the lower portions of the ROTJ logo and in the offer itself. My guess is that Kenner used these cards for testing rather than waste a "bad batch"